IGT’s heavenly new Solar Disc slot is out now and Unibet Casino is celebrating its latest release with a special tournament where £10,000 will be won. To be in with a chance of winning a prize, first opt in then get spinning on Solar Disc between now and Wednesday the 10th of October (2018). The goal is to try and amass the highest equalised win over 20 successive spins at stakes of at least 20p per spin. The top 100 players will win a share of the £10,000 prize pool with the overall winner pocketing a cool £2,500. All prizes are in cash so don’t come with any wagering requirements. If you’ve not seen Solar Disc, then it’s certainly worth a look. Powered by IGT and based on an ancient civilisation which worships the sun, it’s played using an unusual 6 reel, 26 payline game engine. There’s a primitive feel to the design. On the reels you’ll find an assortment of coins, death masks, bears and big cats. As its name suggests, the solar discs are central to the best action here. Whenever these symbols land, they reveal a standard symbol. All instances of that symbol then turn wild and a new payout calculation is made with the extra wilds in position. The other main extra on offer in Solar Disc is the Free Spins Bonus feature – once triggered, you can look forward to 10 free spins. A solar disc symbol is guaranteed to hit on each of those free spins so you can look forward to plenty of extra wild action. IGT slots aren’t usually the flashiest as far as design goes. You could certainly say that about Solar Disc which is more functional than beautiful. The unusual gameplay works well here though. Get on a roll with those magical suns and Solar Disc can deliver some pretty hot action. 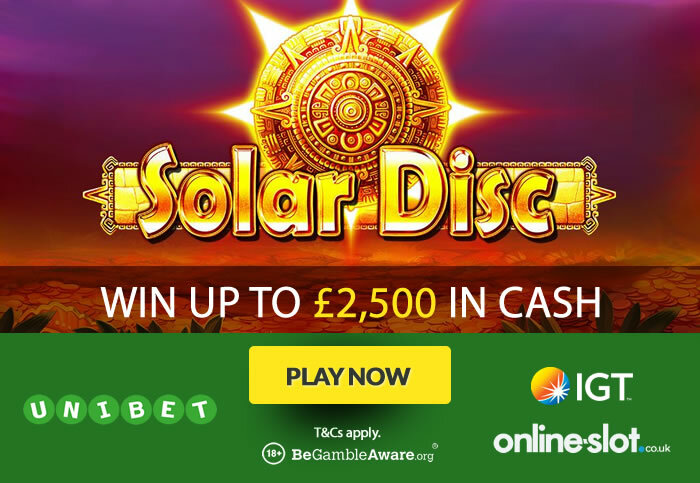 Take Solar Disc for a spin at Unibet Casino over the next couple of weeks and it could get you a bumper cash prize too. If you fancy having a go and are new to Unibet Casino, then you’ll be eligible for a special welcome package. Sign up to get 10 no deposit free spins as well as a 200% first deposit bonus up to £200 – once you deposit, you’ll get up to 190 more free spins (on selected NetEnt slots). 18+. New Customers Only. T&Cs Apply.